"Barack Obama", "Democratic accomplishments", "Economy", "Jobs", "business inventory", "economic direction", "retail sales"
Amidst the plethora of right wing victory celebrations and left puritan whining, the economy continues to show signs of recovery. The signs are quite significant given the time we have just come through. Not only did October see a continuation of substantial private sector job creation (and the loss of government jobs, lead by the layoff of temporary census workers, slowed down), auto sales lead a rally on retail sales, raising it by the highest amount in seven months. Retail sales are a key indicator of consumer spending, which accounts for more than two-thirds of the US economy. Accelerating retail sales are indicative of a consumer market that is picking up. Overall retail sales rose 1.2 percent in October, the Commerce Department said Monday. That was nearly double the gain that had been expected and the largest increase since March. But excluding autos, sales rose 0.4 percent. In a second report, the government said inventories held by businesses grew 0.9 percent in September. It was the ninth straight monthly gain. And total business sales rose 0.5 percent, the best showing since July. Notice that not only do we have better than expected retail sales growths, we also have rising inventory levels. What does that mean? In a word, jobs. How so? The reason jobs were being lost wasn't simply that consumers weren't spending in the midst of an economic crisis. Part of the picture also is that when consumers weren't spending, business inventories kept growing, and they couldn't sell what was in their stock. So, they didn't need more people to make more things, or stock more things, and the employees got pink slips. Hiring again would not start until these inventories were substantially depleted. Consumers would need to begin spending again for that to happen (ergo the vicious cycle, etc. etc.). Inventory depletion would give manufacturers and retailers confidence to start increasing inventory again. So that sounds pretty good on theory, right? But do the numbers track? Let's see. I have gathered data from the US Census Bureau and the Bureau of Labor Statistics to compare how retail and inventories compare to employment growth in the United States - or at least how they have since 2007. Pretty closely, as it turns out. 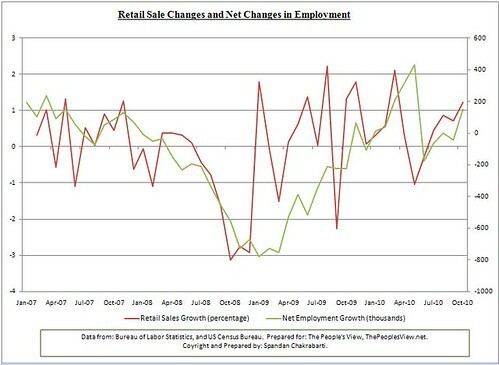 The first chart that follows tracks changes in retail sales with that in employment (i.e. jobs added or lost). The red line represents retail sales growth, and the green employment growth. What do you see if you look carefully? Jobs growth almost always tracks with retail sales, with a time lag. This is expected, since once retail sales falls off, the event that follows is layoffs, and once retail sales pick up, the event that follows is hiring. The story is almost the same with inventories. 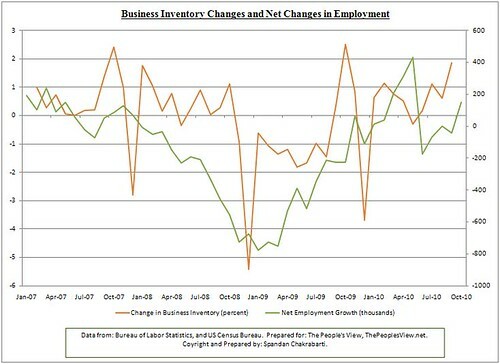 In the next chart, business inventory changes is represented with an orange line and the employment growth in green. As you can see, job growth comes when businesses, after a period of depletion of their inventories, decide it's time to stock up again, since consumers are spending again, evidenced by the growth of retail sales. So this is in fact the expected result. You can see the bigger full page charts here, with one thrown in that compares inventory and retail sales growth rates. As you would expect, they track inversely (i.e. when retail sales are up, inventory goes down and when retail sales fall, inventory increases). What does all this boil down to? Basically that when retail sales and business inventories show a sustained growth, jobs are likely to follow (this is why jobs are called a lagging indicator), and as a result, the economy is likely to look up. In the past year (since October 2009), retail sales have grown every month except two, and business inventories have grown every month except one. It's notable in my view that the retail sales growth was lead by a flood of new auto sales. That's a big deal because a big ticket item is leading the increase in consumer spending. People buy new cars when they are reasonably secure of their financial futures. And whaddya know, consumer confidence is indeed inching up. So, are the jobs coming? It seems that way. Not only did the private sector add 159,000 jobs in October, seeing the tenth straight month of private sector job growth, according to the Job Journal, online job postings are at a 26 month high, mass layoffs (layoffs of 50 or more workers) are down substantially from a year ago, and the average size of mass layoffs have dropped to their lowest levels since 1995. Economic indicators are telling us that this economy is moving again, by objective measures, and the conditions needed for jobs to be added are ripe. Let's also not forget the policies that are helping us get out of the economic disaster that the Republicans had put us in. The largest economic recovery package in history (whether or not you believe it was large enough), the largest middle class tax breaks, a rescue of the American auto industry and a million jobs in it (and cash for clunkers), the emergency actions to stabilize the nation's financial system, credit card reform that is helping consumers manage their debt, and last but not least, extension of unemployment benefits that enabled many who are out of work to sustain themselves and put money into the economy. Each of those steps that Democrats and President Obama took came at a significant political price. But they were the right things for our economy. When the economy recovers, it will, without a doubt, have been the Obama Recovery. Nov 14 LOOK AT YOURSELF AFTER WATCHING THIS!